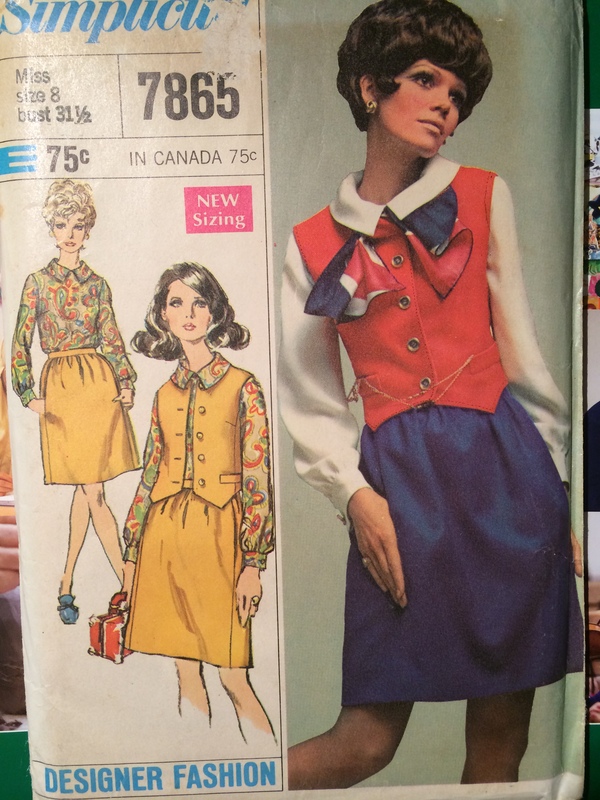 In planning my winter wardrobe I chose this 1960s pattern, thinking a suit with a waist coat would make a nice change. I planned the waist coat in yellow (or red). Then I found a remnant in light grey cashmere that I thought would be perfect for a dry run, or making a toile as we say. With a French accent. I don’t find making tailored items in calico particularly helpful, although that may have been a good idea in this case. This particular fabric is beautiful and soft but it is a little heavy and coat-like. This means all the facings had to be pounded, and even then they were rather springy, and in the picture below you can see the front facing. The pattern proposes top stitching which would have helped keep the facing flat; drawn in, in black, on the pattern envelope in the days before Photoshop. The nap on the fabric and the overall simple look meant I desisted. It is interfaced with cotton Organdie which is my preferred shaping fabric. And lined with a small piece of light pink habotai silk left-over. The buttons are vintage dark brown leather buttons I got on Clitheroe market, in an exchange for a donation to a children’s hospice charity. They are not a matching set, but close enough. I really appreciate that someone took these buttons off a garment before disposing of it. I lengthened the pattern, but made a familiar mistake. I should have added at least some of the length (say 1″) above the bust. This can be seen with the dart being too low for me. So there is some bunching at the waist as it is a little bit too long there. In the final version I will change where I add the extra length. You can also see that the easing of the side piece is not satisfactory. The welts are not as crisp as I would like. 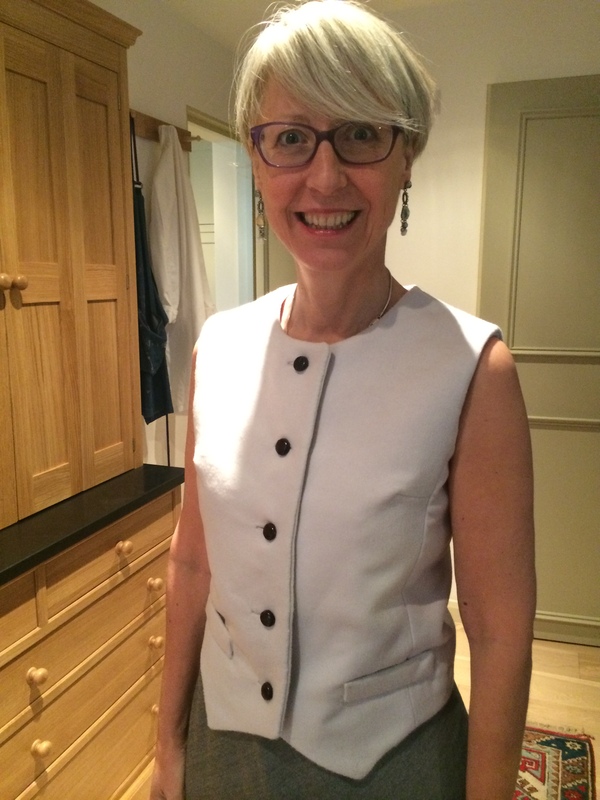 The waist coat is designed to fit closely, which I like. But obviously when you want a close fit, the process of fitting the garment needs to be impeccable, which unfortunately this is not. The problem is worse at the back. The garment is a little too long. You can also see that the fabric is quite resistant to pressing. There is also a line down the middle of the back. This is due to the fabric being a remnant and being folded too long. I did try some gentle sponging but I think it will need dry cleaning to get the dusty stain out. So far not a project I am entirely happy with. I like the pattern, even the pointed hem which I was worried about, and the welt pockets. I think the colour is nice too. But the fabric was inappropriate and it means I will not buy cashmere coating again (for a jacket or waistcoat). With a few corrections this pattern can become a good fit. The neckline and shoulders fit beautifully. It also struck me that I could design a fitted sleeve, or even knit a pair, to turn this pattern into a jacket. Definitely something to work on, and I will wear it for work, probably over a long sleeved T shirt or shirt. I like the contrast of white and grey in the last image. But I agree, the fabric is probably too “overweight” for a tight fitting piece. 1) have you tried flat stitching the facings? That should do the trick of keeping the edges nice and flat. 2) I would get rid of the tiny bust darts and increase the curve of the princess line to create the shaped look you desire. I agree with your analysis of the fit issues and dart placement. It doesn’t look that bad and is wearable. I think a good pressing would help. I recently finished a project using similar fabric and found that steaming the seams heavily and leaving the clapper on the seam until it was cold worked better than pounding; that seemed to “lock” the seam flat. Love watching your projects and posts. Might I say the best thing(s) are the color, beautiful and although the fit is somewhat off it is wearable. I really appreciate your insight, I think you are spot on. The others offer interesting and more expert tips than I have to offer. I like the colour and cozy look of the fabric and I could also see another version in a lighter fabric. The style itself is interesting and fun and I like the points. I enjoy the way you hold things up for analysis and share your process – thanks! Kate, ladies waistcoats are notoriously difficult to fit, yours is spot on in the shoulder and armscye, I wrestle with those areas. It’s disappointing that you’ve had a less than perfect result after using such lovely fabric, (been there done that). I have no fitting advice I’m afraid, just a few thoughts. Consider altering the front edge to avoid having a seam there, maybe try out a grown on facing, in this fabric I’d also question the need for interfacing, perhaps just using it behind the buttonholes may be all that’s needed. 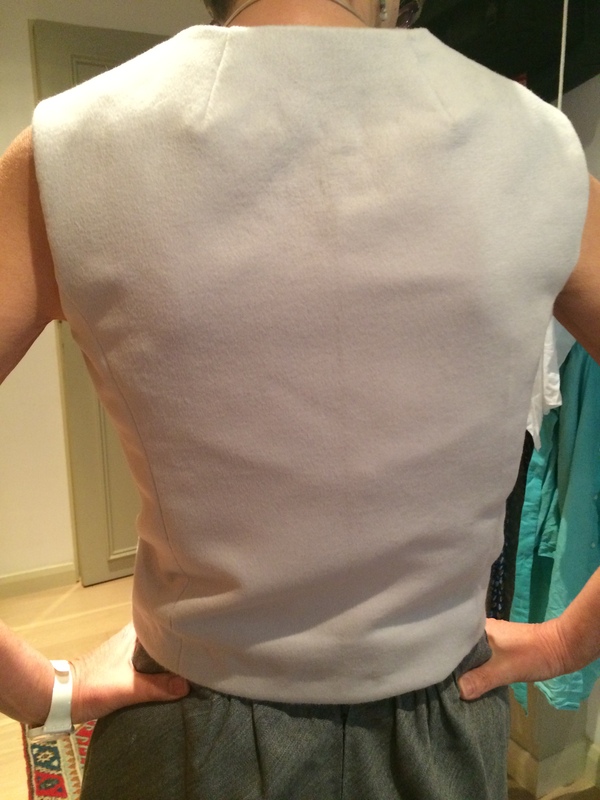 To minimise further bulk you could make the back in a silk if that suits how you want to wear it. I think that fabric would go well with knitting but sleeves but may throw the proportions off that style. It’s a great look for you, the colour and silhouette suits you very well. I would never have thought to put those buttons with that colour but they actually make the garment, using mismatching buttons is very Joules-like. Thank you all very much for your feedback. I really appreciate the suggetions especially from Mary, Galina and Annie. I didn’t think of grown on facings, but yes that may have made all the difference. There are no side seams so a silk back would not be so good with this style. My favourite Joules cardigan has mismatched buttons, which was handy as one fell off! I appreciate the suggestion on clapping seams Maryfunt, and Galina I think I may play around with the seams on the next iteration – I actually love Dior darts and this was one reason why I picked this pattern. I think it just needs more fitting than I gave it, so am keen to have a second go at it. I’m a big fan of vests, or “waistcoats” as you Brits call them 🙂 Don’t add sleeves to this! I find it odd that the pattern has both a kind of princess seam and bust darts. Do you find that strange? I like the side panels, though. The dart points are too high for you. Can you not just lower the dart? Alternatively, you could, ah, get a really push-uppy bra and crank the straps as tight as possible? 🙂 The back of your vest is really attractive. And I think if you just shorten the side fronts (making the front points a little more dramatic), it will hang without bunching. Thanks for your feedback fk! So the princess seams with darts are sort of Dior darts. There isn’t a side seam so you do need a bit more shaping at the bust. 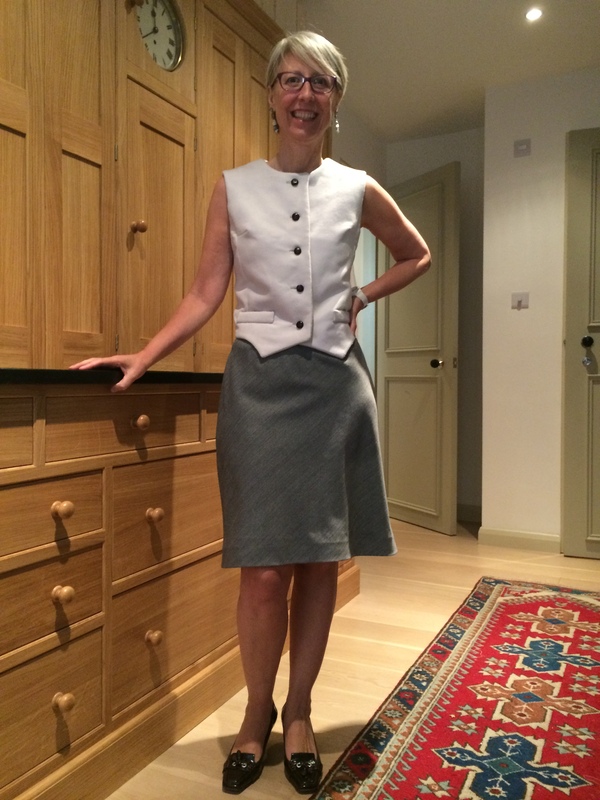 I will make this vest/waist coat again as I too like to wear them instead of a jacket. (In the meantime I may try the hooched up bra trick but I now know that I have a proportionately long upper chest which means I always need to add a little length above the bust dart).